Real Gone's 2016 double-disc set The Definitive Hits Collection -- a physical version of 2015's digital-only The Essential Mickey Gilley -- is the first comprehensive Mickey Gilley collection to be released in the U.S. since the original Ten Years of Hits in 1984. A few other compilations have stepped into the breach, notably Raven's excellent 2007 set Overnight Sensation: Country Hits 1974-1984, a single-disc set that offered Gilley's 26 biggest hits. 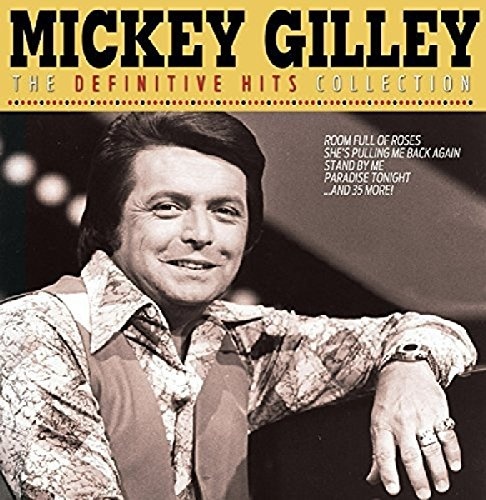 The Definitive Hits Collection offers 13 additional selections, nearly all of them hits because the singer was a fixture on the country charts for 11 years, regularly reaching Billboard's Country Top 10. Only "A Little Getting' Used To," which went no further than 17 in 1979, is overlooked, and there are a few deep cuts that help round out the picture, including the rollicking "#1 Rock 'N' Roll C&W Boogie Blues Man" and "I'll Sail My Ship Alone." Gilley's cousin Jerry Lee Lewis regularly performed the latter and the former sounds like the Killer, as does so many other hits from Gilley, something that The Definitive Hits Collection hammers home. Gilley turned Jerry Lee's wild, wooly country into clean good times, sanding off the rough edges and eventually relying on rock & roll oldies played as nostalgia, not as an eternal songbook. That's not necessarily a bad thing: Gilley is a robust, cheerful performer with an easy touch on ballads, two qualities that kept him on the top of the charts and two qualities that still shine through on this collection of his best.